I wrote a previous article that discussed reasons not to take a Thrift Savings Plan (or 401k) loan. Even though I am generally against taking a loan from your retirement plan, there are times when it can make sense. There are many reasons not to take a loan, but I will refer you back to my previous article for those reasons. Justification of a TSP loan calls for a dire situation, such as high credit card debt. In a scenario where a family has a significant amount of credit card debt, it may make sense to take a loan from your retirement plan. HOWEVER, the reason for the credit card debt needs to be addressed first. If the behavior that got you into the credit card debt isn’t changed, then you will likely fall right back into the same habits. To be clear – before taking a loan from your retirement plan to pay off credit card debt, you need to fix the problem or change the behavior that created the debt. Sometimes life circumstances, such as a family illness or an unexpected move, can create expenses and cause us to quickly rack up debt. Even though these scenarios can happen, I have found that credit card debt is more often created by bad behavior. That behavior is most commonly one of instant gratification. The first bullet point can help you determine if purchases are truly necessary to enhance your life. The second one will keep you from overspending. It is necessary to realize that the budget is there for a reason and it should not be broken! How do we get rid of our high interest credit card debt? Most credit card debt will have an interest rate of 15-22%; therefore it may be necessary to refinance it. Here are a few options for refinancing your debt. It is very important to stay current on your payments; otherwise some of these options may not be available to you. 1. Most cards limit the 0% time period to 15-24 months, depending on the card. Even though 0% may be offered, there is usually a 3% balance transfer fee. If your debt is over $20,000, there is a good chance you won’t be able to do this with your entire amount. Regardless, transferring some of your balance to a card with 0% can be a good option. 2. Many local credit unions offer interest rates that are considerably lower than what credit card companies charge. This option will vary, depending on your location and the institution, but it is worth checking out. 3. There are a few companies that offer peer to peer (P2P) loans. These are loans that you would get directly from other individuals through a P2P lending site. The interest rate you receive would again depend on your credit and other financials, but could give you significant savings in interest. 4. A loan from your TSP or 401k loan is another option. Again, I generally do not advocate taking a loan out against your retirement plan, with a few exceptions. Before taking a TSP loan, you need to be confident that you can repay it, because retirement plans are protected from bankruptcy proceedings where each of the loans listed above are not. The maximum period for a nonresidential loan is five years and no documentation is required. The interest rate that you repay to your TSP is meant to model the interest that your G fund earns. With the G fund earning around 2% annually, the interest rate on loans is really low. You can find more details regarding TSP loans here. High interest credit card debt can be a serious drag on wealth building and should be taken seriously. Every situation is different and should be evaluated as such. Once you have addressed the behavior that created the credit card debt, then you can move forward by finding an appropriate avenue to refinance your debt. 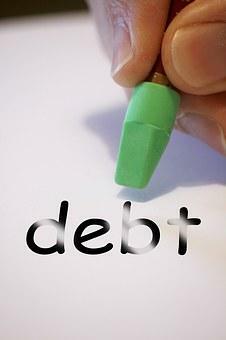 Debt evaluation is one of many elements that we address in our planning process. If you find yourself in this situation and would like some help you can contact me here.